The Interfaces dropdown menu entry in the top toolbar contains lists all the interfaces that are currently monitored by ntopng. Among all interfaces listed, one has a check mark that indicates the interface is currently selected. Every data and information shown in ntopng web GUI relates to the currently selected interface. Any interface listed can be selected simply by clicking on its name. The dropdown menu is only used to switch between selected interfaces, it is also used to actually see interface traffic statistics. Interface traffic statistics can be accessed by clicking on the currently selected interface. A contextual menu with multiple options and badges appear right below the top toolbar. Menu entries are discussed below. 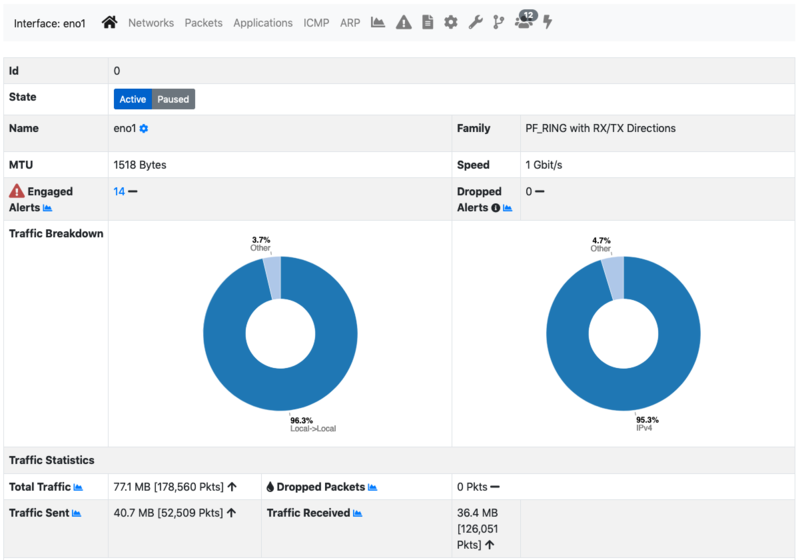 In the Home page it is possible to view general interface information, such as Id (a unique integer identifier ntopng assigns to each monitored interface), family (e.g., pcap), and the overall traffic counters in bytes. It is possible to customise the interface name just by writing a custom name into the Name textbook and clicking on “Save Name”. Interface monitoring can be temporarily paused from the ‘State’ toggle buttons. Packets page shows a pie chart of packets size distribution. Protocols page provides three pie charts and a specific table with nDPI-detected protocols for the selected interface. 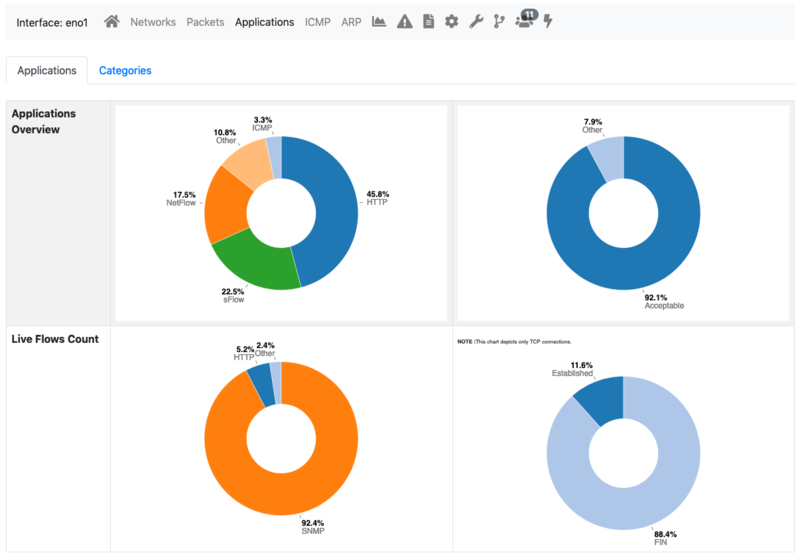 In the two top pie charts ntopng shows the application distribution and its categorisation. The bottom pie chart shows nDPI-detected applications for currently active flows. All labels are clickable and point to detailed statistics pages. Belo pie charts there is a list of protocols detected with the corresponding total traffic, both in absolute terms and as a percentage of the total traffic. 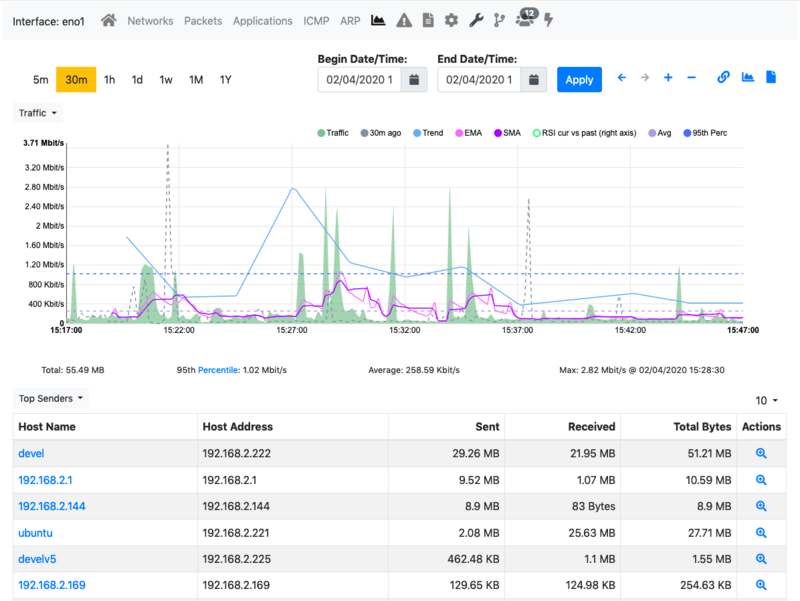 By selecting any Application Protocol, it is possible to display a statistics page with temporal charts for that protocol. Similarly, by clicking on the magnifying lens icon, it is possible to display all active flows for that protocol. 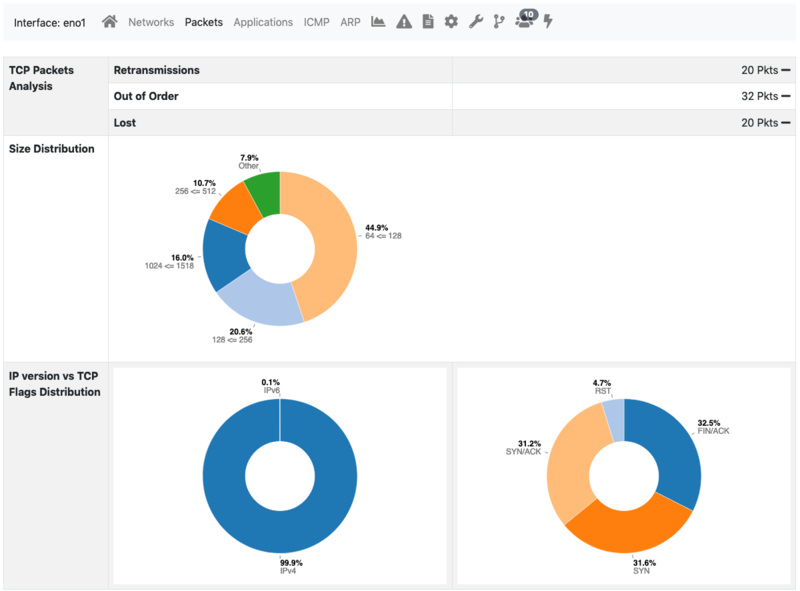 ICMP page shows overall interface ICMP statistics. The Address Resolution Protocol (ARP) page highlights the number of ARP requests and replies seen. Statistics page provides historical traffic statistics for the selected interface. The user can choose to filter statistics on a protocol basis and display data in several formats (e.g., bytes, packets, flows, and so on). In the Professional Version of ntopng, traffic for interface views in shown as stacked per physical interface. Physical interface visualisation can be toggled by clicking on the coloured dot just left of interface name. The time series span can be adjusted by selecting values from 5 minutes up to 1 year. Moreover, drill- down is possible by clicking on the time series itself. Every click zooms the chart in, centering the time series around the clicked point. In addition, time series shown can be chosen via the dropdown menu labelled ‘Time series’. For example, it is possible to visualise all or just one protocol, traffic, packets, active hosts and flows, and so on. Ntopng is VLAN aware, hence if several VLANs are detected, traffic is accounted also on a VLAN basis. Historical interface minute top talkers are shown on the right of the page, and get refreshed automatically when the mouse moves over the chart. An historical “Flows” tab is present next to the “Chart” when ntopng is started with the -F switch. This historical table shows flows data that have been recorded and dumped during the selected observation period. The Professional/Enterprise version of ntopng also feature two extra tabs, namely, “Talkers” and “Protocols” to drill down historical data by talkers and application protocols. See later in this manual for more information. The settings page allow the configuration of several interface properties. Custom Name: Is a label used to identify the interface. Interface Speed: The speed of the interface expressed in Mbps. Typically, ntopng is able to properly determine this speed automatically. Realtime Stats Refresh Rate: Amount of time between two consecutive refreshes of dashboard and footer charts. Useful for example when using ntopng in combination with nProbe to collect remote NetFlow of sFlow. Ingress Packets Sampling Rate: Packets arriving on the interface could have been sampled upstream, for example by a packet broker or another device. This setting allows to specify the sampling rate to enable ntopng to perform proper upscaling. Local Broadcast Domain Hosts Identifier: Determines if Local Broadcast Domain hosts whose IP address is inside a configured DHCP range are serialized by their MAC address or IP address. This setting also applies to the timeseries of the host. In a DHCP network, the IP address of a host usually changes so the host it’s better identified by its MAC address in this case. Hide from Top Networks: This setting allows to specify a comma-separated list of networks containing hosts that have to be hidden from the top statistics. Hosts belonging to the specified networks will not be shown in the top statistics. Trigger Interface Alerts: This setting toggles the alert generation of the selected interface. 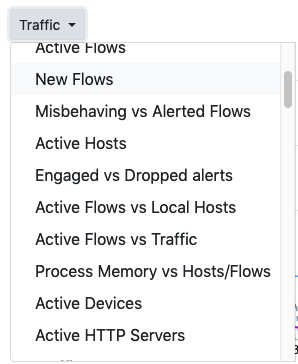 No alert will be generated when this setting is unticked, including alerts associated with hosts, blacklisted flows, and networks. Create Interface Timeseries: This setting toggles the generation of timeseries for the selected interface. No timeseries will be generated when this setting in unticked, including timeseries associated with local hosts and networks. Mirrored Traffic: Tick this setting when the interface is receiving traffic from a mirror/SPAN port. Typically, such interfaces does not have any IP address associated. ntopng uses this information to skip certain kind of activities that cannot be performed on mirrored interfaces, including network device discovery and eBPF events processing. 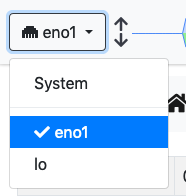 Periodic Interface Network Discovery: This setting toggles ntopng periodic network discovery. 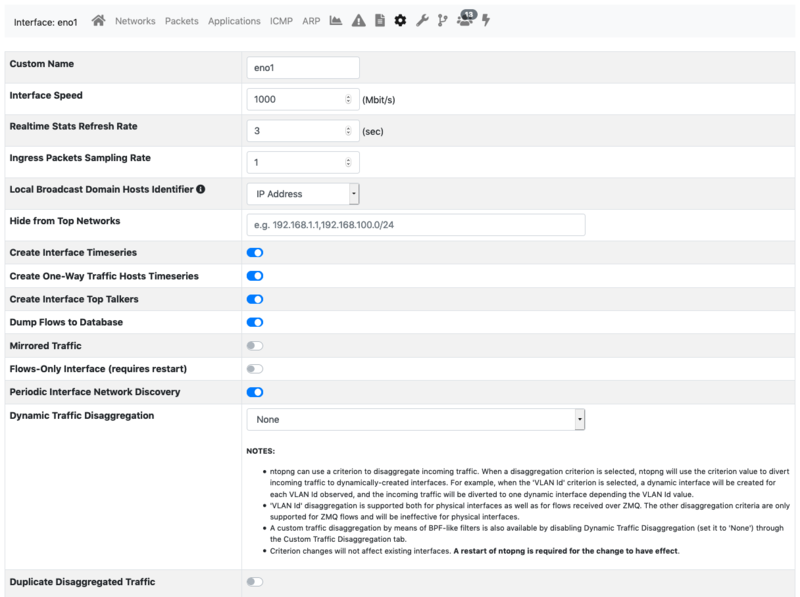 Network discovery frequency can be controlled from the preferences and it defaults to 15 minutes. Host pools are logical groups of hosts. Pools are added using the “plus” button in the “Manage Pools” tab of the Host Pools page. Once an Host Pool is created, it is possible to add members to it. Host Pool members are added using the “plus” button in the “Manage Pool Membership” tab of the Host Pools page. An “Alias” can be associated to each pool member to ease the its identification. Typically, one would assign a mnemonic label as member alias (e.g., “John’s iPhone” or “Smart TV”). A “Device Type” can be associated to each member as well. Devices types are used to categorise members on the basis of the device type (e.g., TV, Camera, Smartphone). The image below shows an “IoT Devices” Host Pool with two members, namely a smart tv and a router. 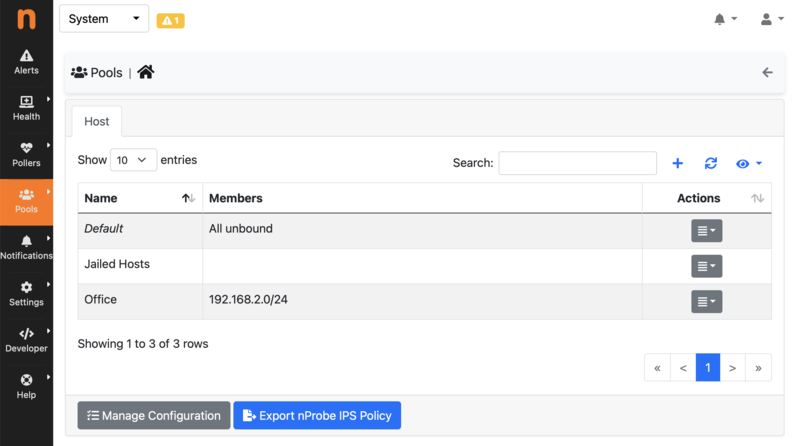 A view of every host pool is accessible from the “Hosts” menu, entry “Host Pools” as discussed in the relevant section. The view shows live pool information (e.g., overall pool throughput) and provides access to the historical pool traffic timeseries (Professional version) as well as to the currently active pool members. Host pools can also be used to enforce traffic policies (e.g, block YouTube traffic for the “John” pool and limit Facebook traffic at 1 Mbps for the “Guests” pool). This feature is only available when ntopng is used inline and is a feature only available in the professional version. ntopng inline is described in the “Advanced ntopng Features” of this document. When a DHCP server is active in the network monitored by a network interface, it’s advisable to configure in ntopng the ranges of IP addresses which such server can assign. When a DHCP range is configured, ntopng will monitor the DHCP traffic on the interface and report anomalous behaviours. For example, it detects if IP addresses are assigned outside the configured range and generate an alert. This can happen, for example, if a new misconfigured network device is attached to the network. Since DHCP responses are usually directed to a specific host, this setting is most effective when the interface monitors mirrored traffic.